many thanks to shaun who has nominated me for the super sweet bloogging award – i am so honored! 4. michael for sharing super sweet wisdom on his blog, me and the boss. 6. shelle and her butterfly project for her super sweet honesty and love of butterflies! my ‘unofficial rules’ to the award winners: please know i am not attached to the acceptance, non-acceptance or whether or not you choose to follow the award rules – i just wanted to nominate you! 1-Thank the Super Sweet Blogger that nominated you. thank you, sweet shaun! 2-Answer five super sweet questions. 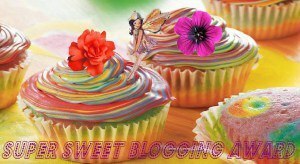 3-Include the Super Sweet Blogging Award in your blog post. visit shaun’s blog looking for reasoning to a complicated world and enjoy! I am honored and blessed to be even mentioned here among the very sweet persons, thank you for your kindness,we should always strive to be sweet to all we meet the world needs sweetness. Thanks…I’ve added this to my Kindness Is / Awards page on my blog. Started the response, will complete in the near future. Kudos on your very deserving awards! I’m ever so grateful for recognizing my humble little blog .